One of my favourite parts about summer is bringing in some of the sunshine to my apartment. 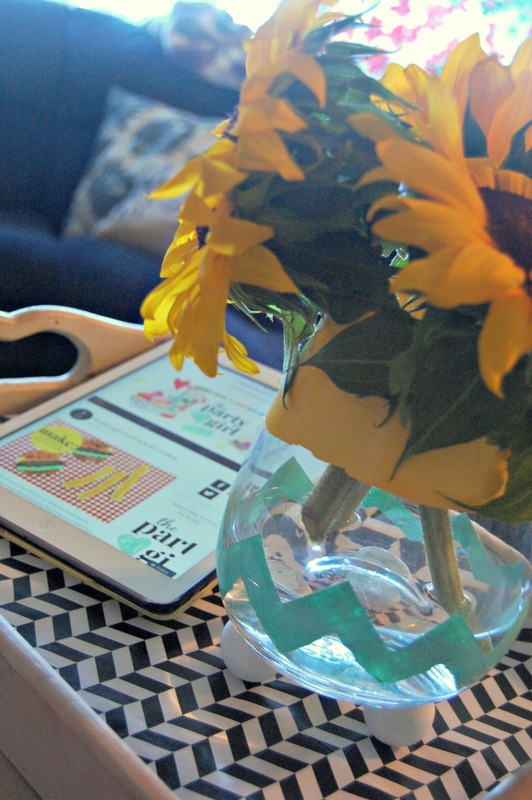 So of course when I saw these sunflowers on sale I bought three bunches, and then immediately realized they deserved a bit more fun than a boring old glass vase I had. 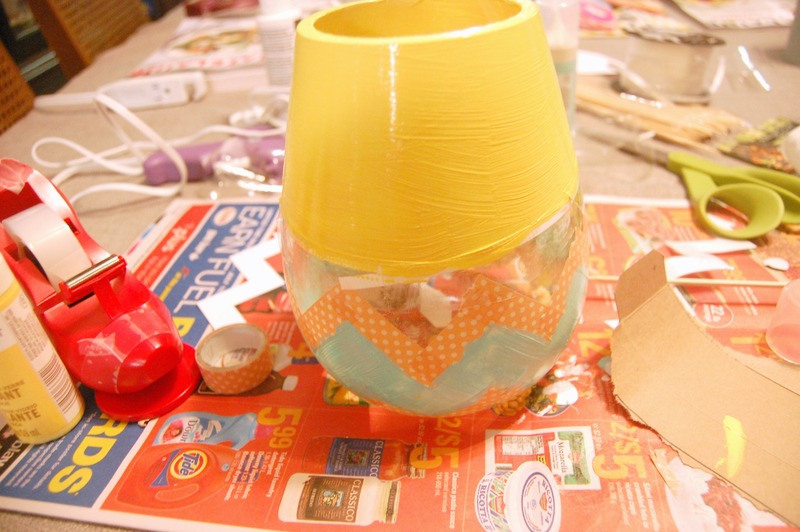 And after I finished this super easy project, I was struck by how cheap and simple it was – perfect for tossing some last minute party decor together! 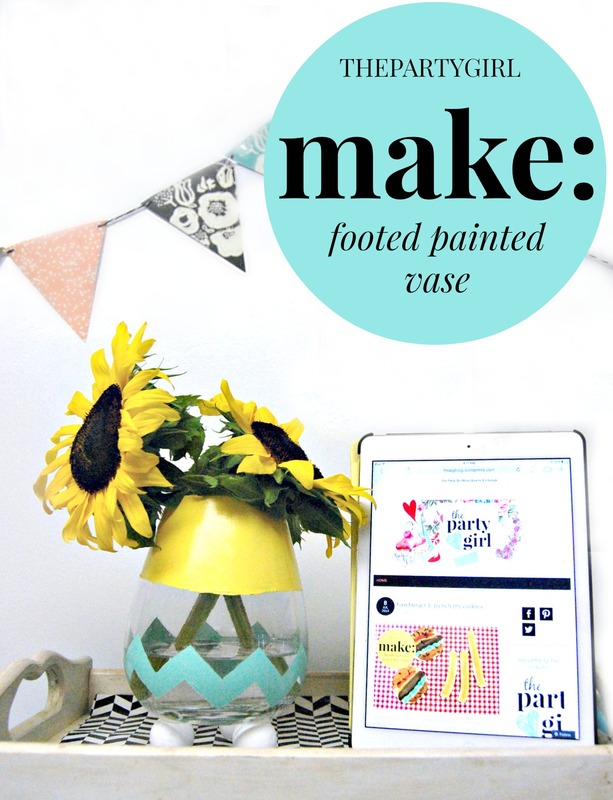 If you need a centrepiece for your next party and a regular vase needs some diy magic, this is the trick for you! You can find most of these materials at the dollar store. I bought the little vase there. 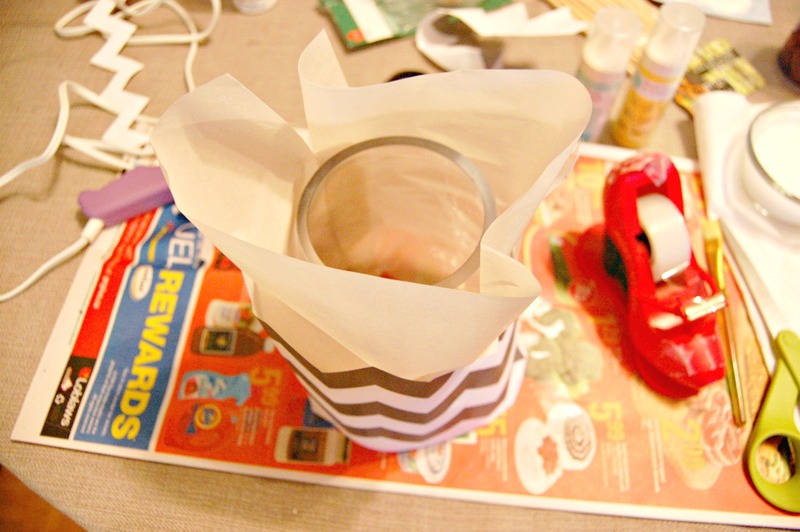 I found the footings at Michaels a little while ago when I first thought about doing this, and they have flat sides on them perfect for gluing to the bottom of your vase. We bought glass paint but honestly I wasn’t a huge fan of it. I think depending on how often you think you’ll be washing it/how carefully you’ll be while washing it, regular craft paint will work just as well. 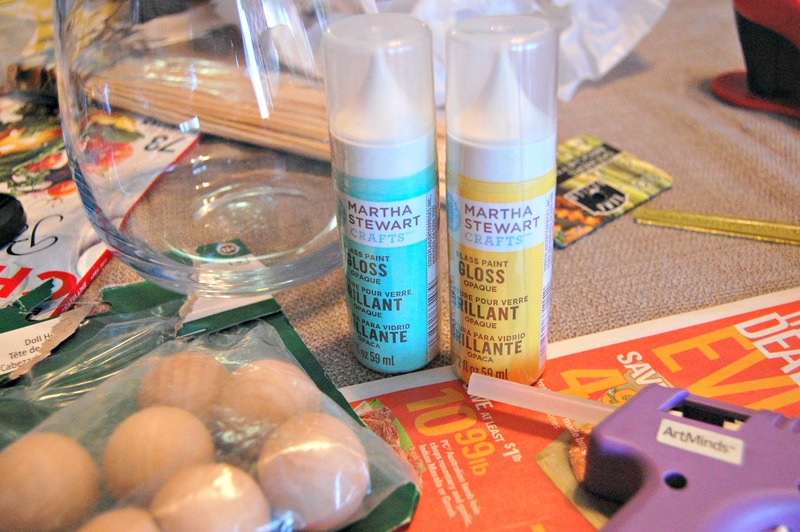 I also had white craft paint, tape, transfer paper, a printed design, and a glue gun. I would say you could do the same project with about half the stuff, but I’ll show you how I did it anyways. First, paint your footings. I decided to paint them white because I liked the contrast, but you can do whatever you prefer. I used craft paint and it dried almost instantly. This is a step you could probably skip. 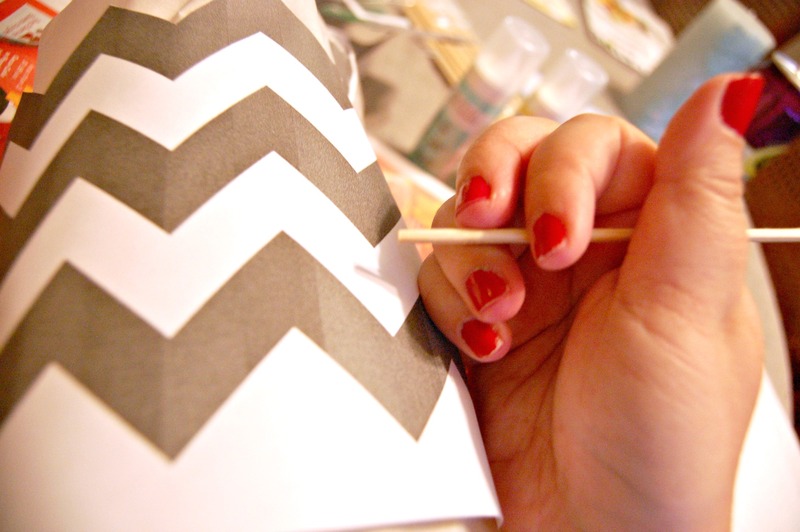 I decided I couldn’t hand draw a perfect chevron, so I used some transfer paper I had left over from another project and a chevron pattern I printed off the Internet. I wrapped the etching paper around the vase, securing it with tape. I repeated that with the design on top. 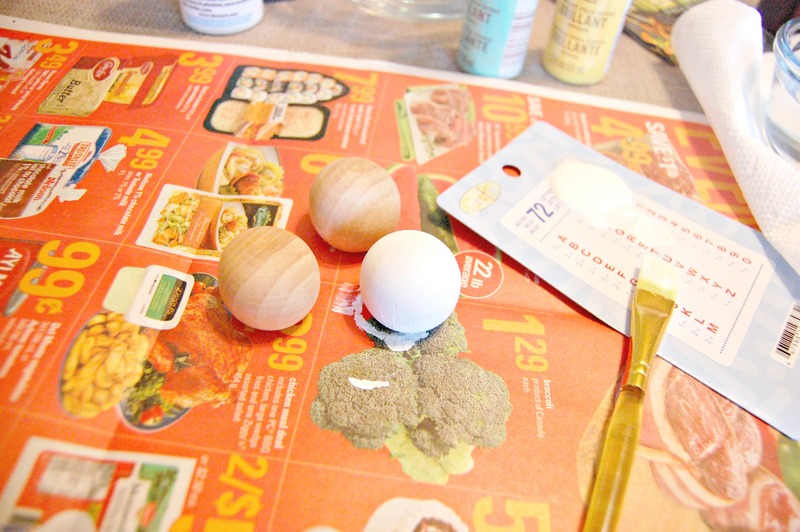 Use a dowel or pencil eraser or something to trace your design. 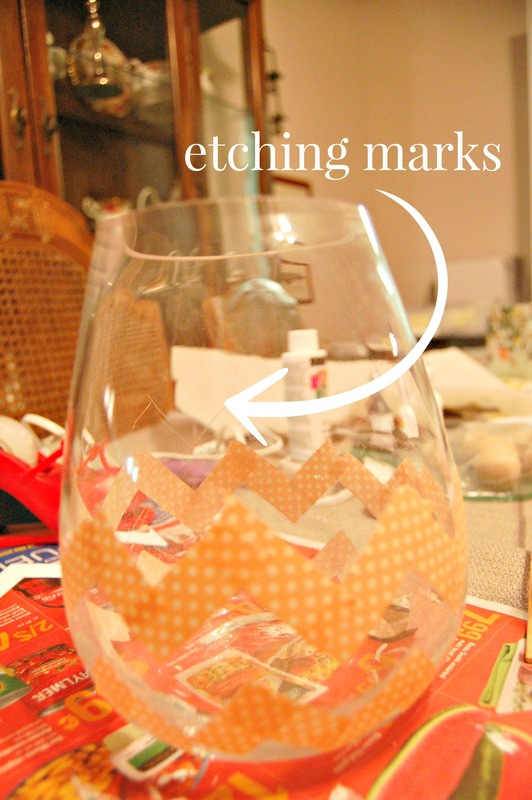 It will leave behind a mark on your etching paper. You can see the etching marks a bit here (I made extra to show you). I would suggest getting some painters tape, but I didn’t have any so I used washi tape. I think it was fine, but it was so pretty I hated to waste it on this. Still, I taped along my graphite lines just to be extra straight. My complaint about the paint was that when I peeled off the tape, even going super slow and giving it like two days to dry out, the paint seemed to stick to the tape, and stretched when I peeled off the tape. It was very elastic like paint, which was frustrating because it ruined a lot of my lines. I ended up free handing it and sort of casually drawing lines so it looked a little deliberately crooked. I think if you give it a try, either free hand it and save yourself the trouble, or try craft paint and see if that’s better. 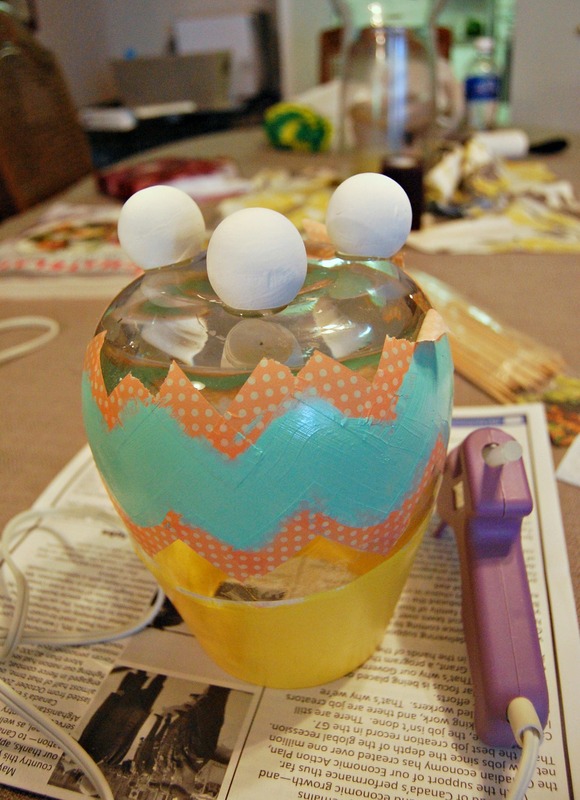 Once your paint is dry, flip over your vase and use a hot glue gun to stick your footings on. And that’s that! It added such a cheerful vibe to the apartment, especially with those gorgeous flowers (locally grown in Ontario too, pretty cool!) to liven it up. With all the rain we’ve had this week it was nice to have a spot of sunshine inside. Let us know what you think, and definitely give this project a try! It would make a great hostess gift with some blooms tucked inside already, or amend the idea and make some pretty coasters or candle holders.